Many polyamide processors are not yet aware of the fact that the Capron® brand continues to exist, although not entirely in the same format as before. Many of the products that the Honeywell company used to sell under the brand name Capron are now to be found at BASF within the polyamide assortments of Miramid® and Ultramid®. For instance, the former Capron BG40G6HIHS, a PA6 type for exterior car mirrors, is now Ultramid B3WZG6. The former Capron BR30HS, a grade for rotomolding, is now Miramid B3W FP. The Capron grades still form a small product range and thus complete BASF’s three-brand-strategy for polyamides. The novelties in the Miramid product line include Miramid A3WZ1, a new heat-stabilized and impact-resistant polyamide type intended specifically for cable conduits. Numerous customer-specific color reproductions and special additives are among the ser¬vices provided by the Miramid brand. Two completely new products being presented to the public at large for the first time are two specially hydrolysis-stabilized PBT types that not only comply with the strict stipulations laid down in the regulations of the United States Council for Automotive Research (USCAR). They also withstand rigorous flexural stress tests at a humidity of 100% and a temperature of 110°C [230°F]. These products are Ultradur® B4300G6 HR and Ultradur B4330G6 HR. SHW Automotive has recently launched a plastic specialty onto the market, namely, the first oil pump that regulates the oil flow on an as-needed basis by means of an external gear pump with involute gears. The special feature, i.e. the fact that one of the two gears moves axially, was only feasible with a high-performance plastic that is not only resistant to high temperatures and oil but that also exhibits very good sliding-friction properties. This is where Ultrason® KR 4113 comes into action, a PESU (polyether sulfone) made by BASF and reinforced with carbon fibers, graphite and PTFE. 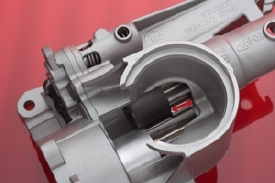 The pump is used by PSA, BMW and Porsche. There will also be illustrative examples and many possibilities to discuss the innovations that were presented for the first time in the year of the K plastics fair such as the product segment of the easy-flowing High Speed grades and the new PPSU (Ultrason P). Further topics are the hydrolysis-stabilized Ultramid HRX types for hot water (coolant tanks) and Ultramid A3W2G10 for hot air (intercooler end caps), heat-conductive Ultradur, blow moldable Ultraform® (POM), special WIT and GID types, halogen-free flame retardants and laser direct structuring for MID components. At the Fakuma, BASF will be introducing another plastic specialty for the realm of medical technology: Luran® HD is the first SAN (styrene-acrylonitrile copoly¬mer) to be offered in conjunction with BASF’s HD services. HD stands for Healthcare and Diagnostics. The transparent Luran HD complements Terlux HD (MABS), BASF’s first transparent plastic for medical technology. Whereas Terlux HD offers better impact-resistance, Luran HD is more resistant to temperature and UV-light. The new material is already available in commercial quantities. The HD service package encompasses not only technical support for applications, compatibility tests with specific chemicals and biocompatibility testing (e.g. according to the United States Pharmacopoeia and ISO 10993-x), but also the creation of so-called drug master files (DMF). For a few weeks now, BASF has been offering a powder version of its Luran® HH (HH: high heat, also called AMSAN), a SAN (styrene-acrylonitrile copoly¬mer) that is dimensionally stable under heat. The new brand goes by the name Luran HH 120 Powder and it is intended specifically for PVC processors. Since PVC is often processed in powder form, it is now easier to incorporate Luran HH, which functions here as a heat-stabilizing component. Luran HH is employed for the production of classic profiles, tubes and panels made of PVC, which are subject to high requirements in terms of dimensional stability under heat, for instance, in the case of hot-water pipes or window profiles. Design also involves the aspects of gloss and surface. Depending on the cur¬rent fashions and tastes, customers want the electrical devices they use in the kitchen, office or bathroom to be matt or shiny. In fact, BASF can offer several new products and ideas for this area of application. The new Terluran® BX 13036, a blend of PMMA and ABS, combines the properties of both components of this blend: the special ABS provides the requisite mechanical properties while the PMMA component ensures scratch resistance, high gloss and good color depth. The so-called piano lacquer look is intended not only for black tones; the trend is moving to¬wards white surfaces for electrical devices and household appliances. The new material is being introduced into the market. High-gloss effects can also be achieved in a different manner. The recently created, very bright and transparent Luran CC (SAN) is now also available in variants that are specially UV-stabilized. Processed in combi¬nation with classic Terluran (ABS) by means of two-component injection molding, this material yields transparent, high-quality top coats for TV set frames, telephones or coffee machines. Luran is as brilliant and scratch-resistant as PMMA and more scratch-resistant than PC, it is easier to process and less costly. BASF’s designfabrik™ provides assistance for the design of new products using these glossy and transparent plastics. The kitchen and bathroom should not only look good, they should also be hygienic. In order to prevent the growth of bacteria on plastic surfaces, BASF is introducing the first antimicrobial ASA (acrylonitrile-styrene-acrylate copolymer): Luran® S BX 13042 comes with a special additive containing silver and manufactured by Agion Technologies so that an attack by various microorganisms is reliably prevented. Elastogran, a company of the BASF Group, has a product line offering tailor-made customer solutions and innovative applications using Elastollan®, a thermoplastic polyurethane elastomer (PUR). As will be shown, this material can be employed, among other things, in the manufacture of hoses, films and automotive parts. The range of applications for this flexible special plastic, however, is much broader, extending from the electrotechnical sector all the way to agriculture. Visitors from the industry will also be shown other select PUR applications. For more information on steel, click here.